Styled with karl jumpsuit . 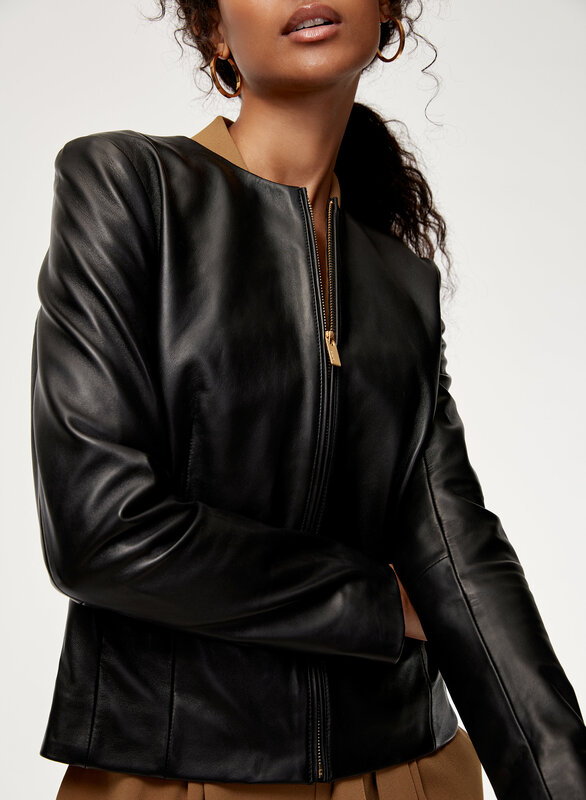 Taking a more minimalist approach to the leather jacket, the Jett is designed with clean lines and streamlined pockets. It's cut from the world's finest sheepskin leather: supple, strong and made to last a lifetime. 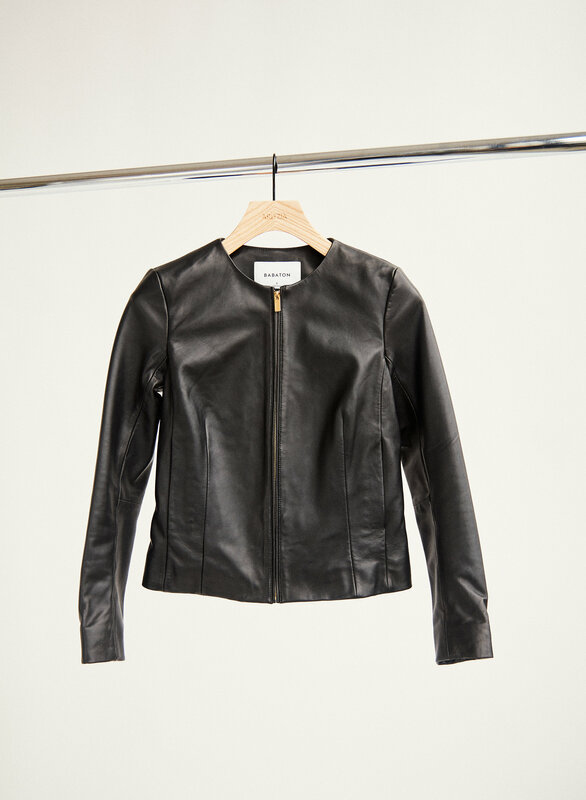 Over time, the leather will soften and develop a lived-in feel — just like a true classic. The body is lined in a breathable cotton blend for comfort. Want to see the entire leather collection? Click here. Super sleek and simple. Wears well. So many compliments. Just as gorgeous as in the photo! This jacket is as simple (no zippers, bells and whistles), classy (gold zipper), and soft as I had hoped. I am fairly broad in the shoulders and chest and the jacket fits perfectly! Leather is super soft. The collar is a bit strange and looks awkward. Maybe it will soften over time. I really wanted to love this jacket. The leather is great and soft, but I hated the cut. It just didn't sit right, looking more like a shirt than a jacket. I purchased a small, but perhaps an xs would've fit better. I selected true to size - but depending how you like your leather jacket to fit - and I like mine very fitted - it might help to downsize. Amazing, soft and buttery quality leather that is a minimalist take on the classic moto. I bought this in a Medium (I usually wear a Medium in most things but sometimes a large). It fits snug but I like that fit and I am sure it will stretch and mould to my body (I can easily do up the zipper if I want). Truly exquisite...the cut is simple and classic. I got the black zipper for a real minimalist look...so easy to add gold or silver jewelry if I want to dress it up. The black zipper makes this very easy to dress it right down if I want. Got it on sale which is just a bonus. I absolutely LOVE LOVE LOVE this!!!! I really wanted to love this jacket. Minimal and beautiful quality. It was exactly what I had been looking for. I’m usually a large in most things but I found this to be too tight in the shoulders and restricted arm movement. I really wish they had made this in an xl so I could size up for mobility and comfort. 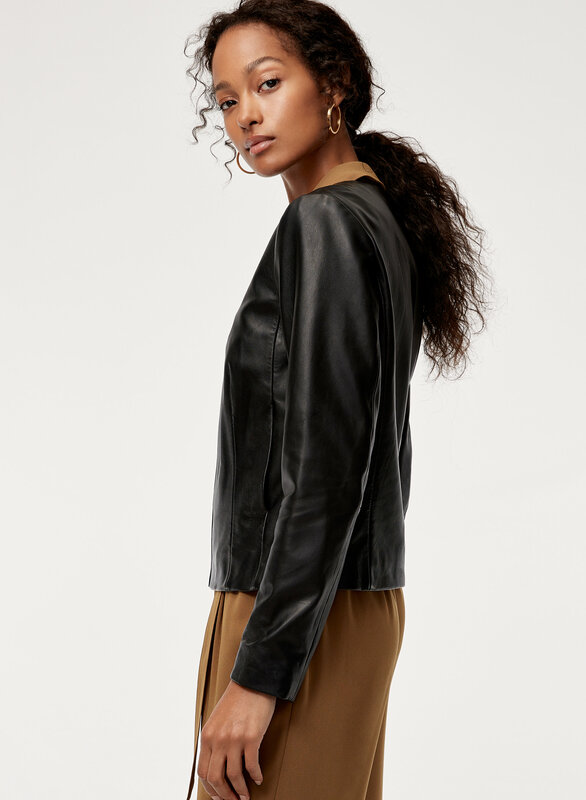 This is a leather jacket you can where with anything!!! I especially like the gold zipper, which gives it a little more luxury!